Ow.ly is a URL shortener that has gained a measure of popularity of late. It ties in with the HootSuite service, which allows you to schedule tweets, manage multiple Twitter profiles, and track link statistics. Ow.ly and HootSuite together are sort of like an amalgam of Tweetable, Bit.ly, and TwitterFeed. But let’s focus on the URL shortener for now. Ow.ly has a clean, easy to use interface. 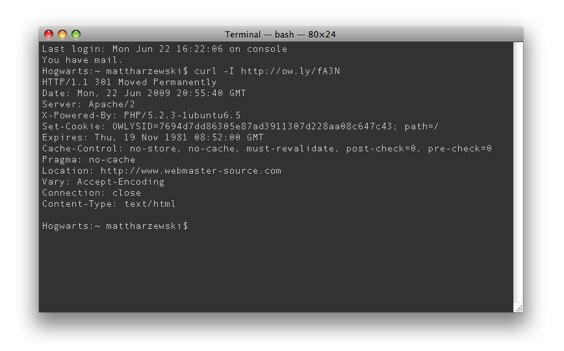 The resulting URLs are along the lines of http://ow.ly/fA3N. As of yet, there is no API available, though one is in the works. Time for the controversial part. Ow.ly’s short URLs display a thin, unobtrusive toolbar at the top. This means that the page is, of course, displayed in an iframe. Unlike the ever-popular DiggBar, there are no ads, and they’re not going to steal your incoming links. The toolbar doesn’t get in the way too much. (It’s hard to see it in the screenshot, isn’t it?) Most of the services it offers are beneficial to your users. An easy link to retweet the link (it opens a sliding panel with a form to post the link to Twitter), a similar button which reveals a similar panel full of links to share the link on various social media sites, and a link back to the original tweeter’s Twitter profile are among the most prominent features. If you want to view the page without the toolbar (perhaps to get the full page URL) you can click the little “x” button in the corner. When an Ow.ly page is loaded, the server sends a “HTTP/1.1 301 Moved Permanently” header, along with one listing the original URL. This means search engines and the like will ignore the fact that the Ow.ly URL exists, and follow the invisible header information to the original location. I think this feature benefits both end users and publishers. It makes it ridiculously simple to rebroadcast a page via Twitter, StumbleUpon, Digg, Facebook, Delicious, or whatever social media service they prefer. It provides plenty of value for the screen real estate the toolbar takes up, and it doesn’t take away any traffic or links from the publisher. Sounds like a win-win situation to me. What’s your opinion? Good or bad, why?